The Scottish Culloden targe, as a restored recreation, is based on a historical piece that was captured during the Battle of Culloden in 1746, during the Jacobite Rising, and has since been kept in the Museum of Royal Armouries in the Tower of London. The targe was a classic shield of the Scottish trooper, possessing a small size that allowed it to be carried and used with ease. This particular recreation is rather ornate in its look, being made entirely from wood and hand-dyed leather. 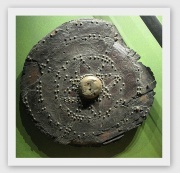 It features embossed designs on its front, as well as concentric circles formed from numerous brass rivets. 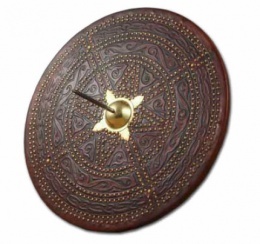 A star pattern of brass rivets adorns the center of the shield and wraps around its central brass boss. 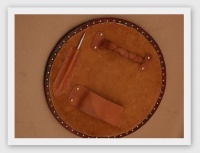 The targe comes complete with a leather strap and handle on the back, as well as a small sheath for holding the removable central spike (which can be affixed to the front to make this shield into a spiked targe). The shield has a diameter of approximately 19 inches, and weighs about 5.7 pounds. For a historical shield to complete your highland attire, look no further than this Scottish Culloden Targe, as it will bring a great deal of appeal to your style, while also serving you well as a historical collectible and display piece, in your down-time. The Primus range represents the pinnacle of Deepeeka quality historical replicas. Each item of this signature line is developed from original design patterns in consultation with the museum staff who have direct access to the original pieces. Additional production development is done with assistance from American and European experts in the field. Only then are these pieces painstakingly created by the finest of Deepeeka’s skilled craftsmen. Final quality control is double checked to insure the strictest adherence to even the slightest of details. Deepeeka Exports is extremely proud and pleased to offer the Primus line as the culmination of years of continuing dedication to quality and historical accuracy in these fine products. The Culloden Targe is named for the battle in which it was captured as a prize. The Battle of Culloden Moor was the final crushing blow to the Jacobite Rebellion of 1745. This was the final effort directed by Charles Edward Stuart, also known as "Bonnie Prince Charlie" or "The Pretender" to regain the throne of England for himself and his family. It was believed that supporters of Prince Charles in England would rise to his cause; also that French troops would support his own Highland forces. This was not the case; as many as 2000 Jacobite troops were killed or wounded, while the Duke of Cumberland lost 300 or less supporting King George II. The original of this shield was probably used by one of the soldiers from the Scottish Highlands, and may be seen at the Royal Armouries Museum in the Tower of London. This targe is based on the original targe that was captured at the Battle of Culloden in 1746, and is now on display at the Royal Armouries Museum. This page was last modified on 28 December 2014, at 08:45.